Information subject to change. Please contact the Residence Life Office for updated information. The majority of our First-year student rooms are double occupancy, meaning two students per room. Some third floor rooms in our traditional halls are built to accommodate three students, and are considerably larger than the double rooms. Most single rooms are made available to returning students first; therefore, most students who want to live in a single realistically will get one in their Sophomore or Junior year. 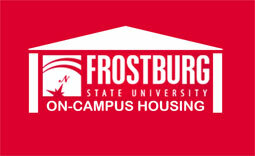 Singles for First-year students are only available for those in the Frostburg Honors Program. When a resident applies for housing they are able to request a roommate through our online process. If there is a mutual request for a preferred roommate by both individuals and their preferred housing options match, we will give first preference to this kind of mutual request. If you meet someone at FSU Summer Preview and both decide you'd like to room together, you may make a request using the Self-Service housing portal up until the last day of Preview. Once that date has passed, the system will be closed so we can run assignments. As an office, we will also attempt to place three friends together in a triple if they all mutually request one another as well as program types. What if I don't know anyone to room with? The housing request form asks you to indicate your preferences on a number of roommate compatibility factors. We use that information to match you with a roommate who considers the same factors most important. The earlier you submit your housing request, the more likely you will be placed with a roommate who shares your preferences. Will I be guaranteed a room on campus? Rooms are assigned on a first-come, first-served basis; though returning students have first option for available rooms, in the past few years all new students requesting housing have been successfully assigned. FSU has a first-year live-on residency requirement (sophomores starting Fall 2020). Should a student wish to live off-campus their first year, they will have to request a release from housing through the Housing Self-Service portal. Traditionally, over 90% of new students have chosen to live on campus due to the proximity to classes, the convenience of the meal plans, and the relative ease of adjustment that comes with living in a residence hall community. When will I be notified of my room assignment? Since many students meet and get acquainted with other new students at our Summer Preview, we wait until after the last session before making room assignments. Generally, assignments letters, including the names and addresses of assigned roommates, are emailed in mid-to-late July. What if I don't get along with my roommate once we move in together? Our residential staff members are trained to help roommates communicate with each other, to identify what they consider important, and to negotiate the "roommate agreement." However, if roommates decide that they are not compatible, the staff will also facilitate a room change for one or the other roommate. The only times that room changes are not allowed are during the first two weeks of any semester; these "room freeze" periods give us time to verify vacancies and maximize the options for those who wish to relocate. How large are the rooms? Once you are assigned to a room, we can give you the specific dimensions of that room, including floor, window, closet, etc. Though room sizes vary, most double rooms are about 12' x 12', and most triple rooms about 12' x 20'. Most of our beds are twin sized, requiring standard twin sheets. Annapolis, Cumberland, Frederick, Frost, Simpson and Westminster Hall are furnished with extra-long twin beds and therefore need extra-long twin sheets. Students who live within another hall may make a request to the Residence Life Office for an extra long bed either through email or by calling our office directly. Requests will be considered and approved based on availability of mattresses. All requests must be be made after students receive their specific room assignment. Can first-year students have cars? Any student is allowed to have a car on campus, as long as they register the vehicle for on-campus parking. The registration fee is $40; this fee is waived for on-campus residents. Each roommate gets a bunkable/loftable bed & mattress, desk & chair, dresser, and lockable closet. Each room also comes with a Microfridge, which is a combination refrigerator, freezer & microwave. Each room has their own wireless box and ethernet port, giving access to the FSU network. The wireless device, while being a wireless hub for the student room also has three wired ports for students to use with an existing computer, television, game system, etc. Student rooms have a phone port but to activate this service, students need to contact the Residence Life Office to opt into a local use phone plan. Student rooms are also equipped with a cable outlet, providing free access to over 50 television channels. Students do need to provide their own cord to access the outlet. Air conditioning is not available in halls to which first-year students are typically assigned. What facilities are available in each hall? Each building has one or more laundry rooms, with access to free, unlimited use of machines for residents only. Each building also has at least one kitchen, except Sowers Hall, along with recreational and study lounges. The buildings also feature vending machines from which students may buy products using their Bobcat debit card or cash. While there is no curfew for residents, safety requires certain limitations. All residence halls are locked at all hours and residents must use their room keys or ID cards to enter their buildings. In all of our residence halls, guests and visitors must be accompanied by their host at all times. Frostburg State University has been consistently rated as one of the safest colleges in Maryland over the past few years. However, we encourage students not to be lulled into a false sense of security; the best way for students to protect themselves against crime is to be aware and responsible. We encourage students to always lock their room doors, walk with a friend at night, and take other steps to decrease their chances of becoming a victim of crime.